My daughter has been asking (and begging) for a pair of Heelys for about 3 years now! I actually think it all started when she was in Kindergarten, but in my opinion she was way too young. To be honest, the only thing I could think about was her wearing a pair and hurting herself. Now, my daughter is 8 1/2 years old, and is the proud owner of a pair of black and pink Heelys! My 11 year old son also got his very first pair at the same time, his are black and green. Added bonus, I can wear my sons Heelys - so I had to try them on and give them a try! I was pleasantly surprised at how comfortable Heelys really are. They are also fun, functional and stylish. Their variety of styles and colors appeal to everyone, even the pickiest child! Of course, they do require a little patience and practice. Both of my kids improved daily, before too long they will be mini professionals! A couple days ago, they were having Heelys races around the kitchen table! (Yes... I'll admit they have been using them in the house! It's been raining non-stop for the past two weeks, so we are having cabin fever.) At this point, I'm willing to let them do just about anything in the house as long as they are having fun, being active and getting along. Heelys are the two-in-one shoe that lets you take life at your own pace. With the wheels out, the stylish designs perform and look just like any other shoe. When you easily put the wheels in, you roll at a different speed. 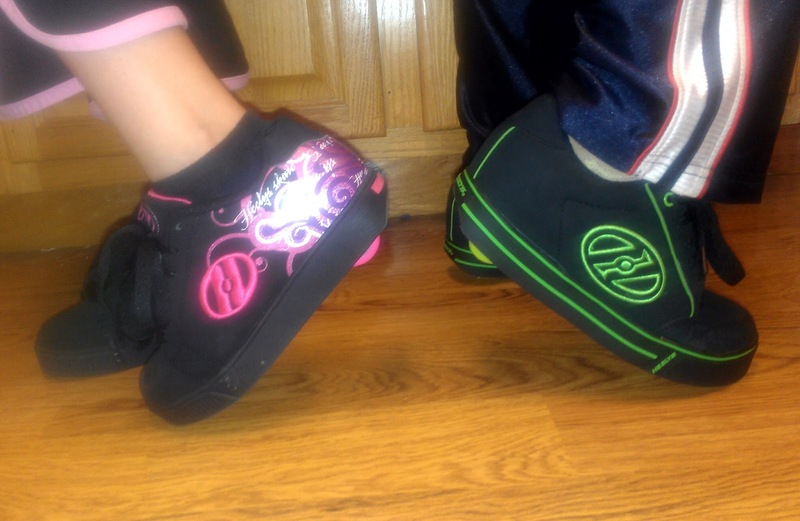 Heelys are about exploring your freedom, unleashing the fun and empowering you to be fearless. Please make sure to tell your child about the skating safety rules before they take off on their Heelys! My husband wants a pair of these. Do you know if I can get them in men's size 13? I bet my son would love them too, although I'm sure he's too busy right now to be safe in them. My youngest son has these Heelys also. He loves them so much I bought a pair for myself. LOL! These are awesome! My sons both would love these.